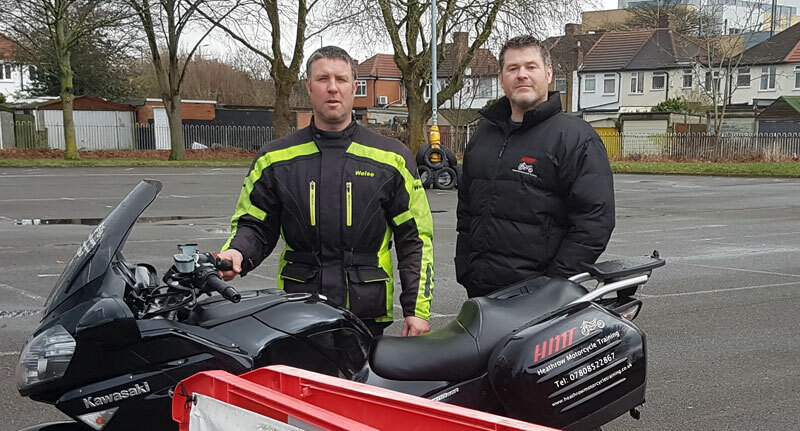 Road safety conscious instructors Graham Gardner and Mark Baker, from Heathrow Motorcycle Training, give you the low down on what you have to do – and what you should do – with regard to motorcycle clothing. Let’s start at the top - I’m sure you all know that by law you must wear a safety helmet when riding a motorcycle or quad bike on the road. Or comply with UNECE Regulation 22.05 and display the relevant badge. A £50 helmet is as safe as a £1,000 helmet as long as it is approved and certified. It is not advisable to purchase or use a second-hand helmet – you do not know the history! If you see a £600 helmet on an online market website for £200, described as ‘brand new’ – steer clear as something is clearly moody. SHARP provides advice on how to select a helmet that fits correctly and is comfortable, along with information about the relative safety of helmets - to help you make an informed choice. SHARP advises that you should try on as many as helmets possible that are in your price range. Of those that fit correctly and are comfortable, select one with a high SHARP safety (Star) rating. The only legal requirement to ride a motorcycle on the road is that you must wear an approved helmet. However, in addition to that it is strongly advisable to wear motorcycle protective clothing that is fit for your individual needs and budgetary constraints. There are many outlets to choose clothing from. It is advisable to try clothing on as the sizes vary across the spectrum - a large by one manufacturer is different to another fit and style. The internet offers savings on clothing and helmets - but if they don’t fit you’ve got the haste of returning and reordering. With regard to hi-viz, our advice is: be seen, try to stay away from all black clothing, look for reflective material on garments - and keep your clothing clean. An excellent comprehensive guide to protective equipment can be found here. (1) The Secretary of State may make regulations requiring, subject to such exceptions as may be specified in the regulations, persons driving or riding (otherwise than in side-cars) on motorcycles of any class specified in the regulations to wear protective headgear of such description as may be so specified. (2) A requirement imposed by regulations under this section shall not apply to any follower of the Sikh religion while he is wearing a turban. (3) Regulations under this section may make different provision in relation to different circumstances. (4) A person who drives or rides on a motorcycle in contravention of regulations under this section is guilty of an offence; but notwithstanding any enactment or rule of law no person other than the person actually committing the contravention is guilty of an offence by reason of the contravention unless the person actually committing the contravention is a child under the age of sixteen years.